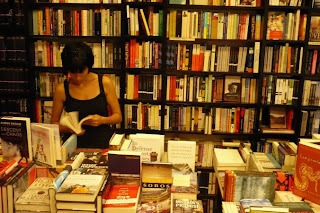 If we are to judge the inhabitants of a city by the number of bookstores in it, then Parisians indeed love to read. Heck, there are around 160 bookstores in the 5th arrondissement alone, and not to mention those 250+ bouquinistes (book stalls) along the River Seine and various Paris libraries throughout the city - Paris is surely a book crazed city. As we were walking its streets, often we found ourselves astounded at the fact that we kept bumping into a bookstore literally at every step. More importantly, nowadays, when independent bookstores are already on the endangered species list, a visit to Paris will surely make you feel like there still is a ray of hope for their survival. Suffice to say, not only a great number but a vast majority of these bookstores stocks only books in French but those who say that Paris has nothing to offer to the non-French speakers are either fools or simply very wrong. Shakespeare & Co is one of very few bookstores, which has gained a widely respected legendary status. The word about this bookstore has spread way beyond Paris and even France, and during the years it has turned to something which can be described as a place of pilgrimage for aspiring authors and book lovers from all over the world. If you need more facts, consider the following: Shakespeare & Co has appeared in several movies (its most notable appearance links to the movie Before Sunset with Ethan Hawke and Julie Delpy) and several books were written about it, this bookstore even has its own Wikipedia article. So you can imagine, that knowing all that made us eager to see it and to judge for ourselves, whether the legends correspond to reality. We definitely enjoyed our visit. Of course, Shakespeare and Co today isn't the same place it has been in the 60s, but it has still managed to conserve many aspects of the original atmosphere and just walking among its shelves makes you think about the incredible moments it has witnessed. We browsed, we visited the writer's room, played the piano, bought some postcards and left feeling very good that Shakespeare and Co is still there, with everything it represents. You can find a more detailed description of the bookstore in our post, and we're also recommending this neat short video, titled Shakespeare Sleeps Here, sent to us by one of our readers, which will tell you more about the culture, history, and evolution of the bookstore. What we really liked about the Abbey Bookshop was its interior: books on the shelves, on the shelves behind the shelves, on the floor and on the books themselves: stacked all over the place, in several rooms and even in the basement - down from the floor reaching some 3 meters to the ceiling, making it slightly difficult but yet very very amusing to browse. Furthermore, it has this rustic feeling to it. 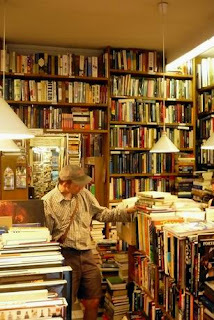 Combine everything and there's your secondhand bookstore with a soul of its own, and what a soul it is. This Canadian-specialized bookstore is a recognizable trademark of many expats living in Paris and there's no surprise that you can see a huge Canadian flag hanging above the bookstore's entrance. Of course, the selection which Abbey Bookshop has to offer should by no means be undermined, on the contrary, we found it very impressive. Even the prices are rather friendly, especially on the books which were on a special offer, outside the bookstore. We were lucky enough to have found ourselves in the bookstore at the same time its owner, Brian Spence, was there. 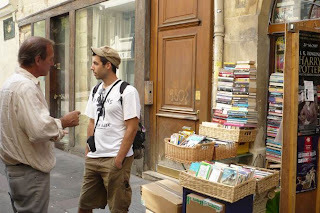 Brian offered us some coffee and we had a lengthy discussion on the Paris' bookmarket and, among other topics, the history of the building and the street where the bookstore is located. 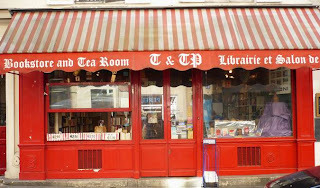 After a lengthy journey from the center of Paris to the 6th arrondissement, we have finally reached our next destination - the bookstore by the name of Tea & Tattered Pages. If we were to sum up our impressions in one word, it would undoubtedly be the adjective charming. If it weren't for the price tags in Euro, Tea & Tattered Pages could just as well travel thirty years back in time and no one would find it suspicious. And this doesn't mean that this bookstore is an outdated institution which has nothing to offer in the 21st century. On the contrary, its preserved charm from the old days and its peacefulness definitely represent the greatest assets it has to offer. Browsing in Tea & Tattered pages equals forgetting about the outside world and never knowing what you are about to find - maybe the dusty paperback cover will turn out to be some cheap romance novel you'll quickly put back to its shelf and maybe it'll be the title you've been searching for in vain for a long time. It symbolizes the image of a true second hand bookstore which has stood the test of time, it's not stuck in the past, it just brings a precious piece of the past to the here and now. Luckily, bookstores like this one still exist, although their numbers have been diminishing, and a few more can be found in Paris. And as long as there are people who don't mind the long journey to the 6th arrondissement because they know that they'll be rewarded for it, Tea & Tattered Pages will remain to be one of them. San Francisco Book Company was the last bookstore we have visited before leaving Paris and the saying "last but not least" can be applied in its case very well. Actually, this exclusively English second hand bookstore has been one of the highlights of our summer bookstore hunt. Although this place is completely packed with books, they manage to keep them displayed in a well-arranged manner so you can comfortably find the titles you're looking for. The English second hand bookstore scene in Paris is more than satisfactory and we were especially impressed by the fact that each one of these bookstores is unique in its own way. Besides the warm and friendly atmosphere of this bookstore there are two other facts that make San Francisco Book Co stand out - 1) Its fiction section - maybe we're subjective, but we were able to find several books by almost all of the authors who belong to our favorites, and this doesn't happen often, especially in second hand bookstores. 2) This bookstore offers its titles at the most affordable prices in Paris, which is something all the low-budget travelers will appreciate in the city which can hardly be labeled as price-friendly in general. For those who are not that keen on books that have a smell, or as we prefer to call it 'a special scent' of secondhand books, there are always those bookstores which specialize in selling new books only. These may usually be more expensive but at least you'll know for sure that the pages of your books won't have any scribblings inside. For an out of print book, one would always turn to an antiquarian bookstore, while, on the other hand, new bookstores are always there for you when in need of a newer and recently published book. And so we move on to the next category - bookstores selling new books. To each his own. The poem is an imagist one and there is a whole other layer of meaning beneath its surface. 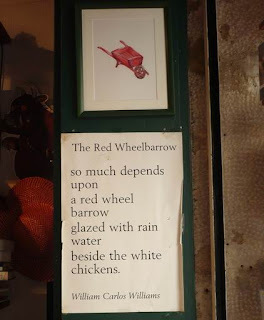 It was written in a little over five minutes and the clear contrast between the red wheelbarrow and the white chickens and the division of the lines make this poem more than ordinary although the poem itself represents and praises the ordinary. This is also true about The Red Wheelbarrow - the bookstore - seemingly ordinary but yet much more than that. This small bookstore is filled with books - way more books than its size can take. It simply oozes familiarity and friendliness above all - its Canadian owner has made sure it does. 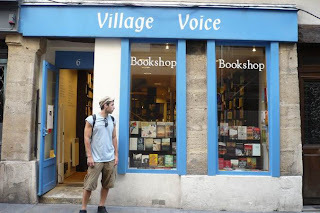 Another stop on our tour of Parisian English bookstores was in the historic Saint Germain de Prés neighborhood at the Village Voice Bookshop. 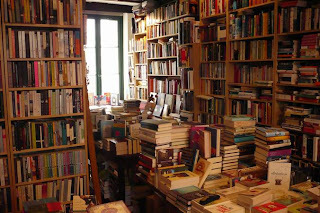 Another independent Parisian bookstore which has achieved an almost legendary status during more than three decades of its existence, and another charismatic founder/owner who has decided to share her love for books with others. Village Voice Bookshop doesn't have a second-hand section, as it only sells new books, which gives its owner a better possibility to pick the titles she wants to offer to her customers. After the nice walk from the famous Jardin du Luxembourg we entered the rather narrow Rue Princesse and spotted the blue exterior of Village Voice. The face of this neighborhood has changed a lot and nowadays it is mostly home to fashion boutiques and expensive cafés, while Village Voice still stands as the last reminiscence of the old days. We wouldn't like our report to sound too nostalgic, but we've also heard that Village Voice Bookshop is struggling to survive and during our visit it was sadly empty. To end on a positive note we would like to stress that Village Voice still sticks to its principles and beliefs - the selection is still altogether different from the regular chain bookstore offer and author readings remain a regular feature of this bookstore. However, these are not the only bookstores that Paris has to offer. 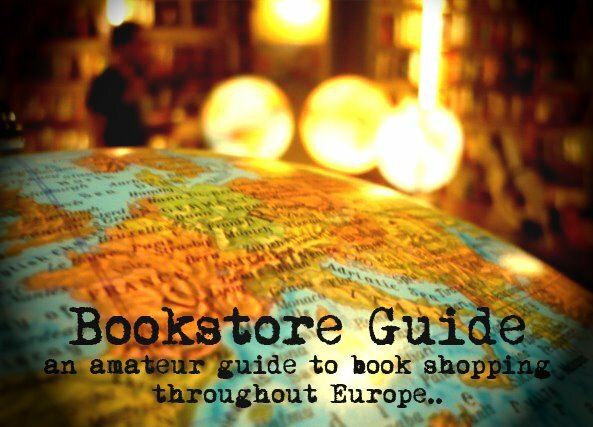 For those with a sharp eye for art, there are many artsy bookstores and we've singled out a couple. Even the fact that this bookstore is quite remote from the center of the city actually adds to its cool suburban/subculture image. 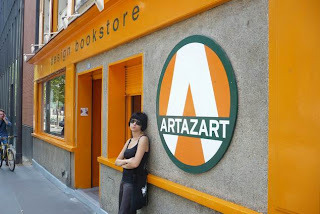 It has been one long walk in the beaming sun, but Artazart was a must on our Bookstore Guide list for Paris. After visiting some great art bookstores in Brussels (Posada Art Books, Librairie Saint Hubert), we weren't that easy to impress anymore. However, Artazart is a completely different bookstore, which scores additional points not only for its stock, but also its looks. 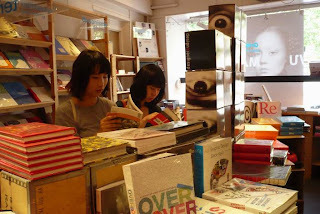 This bookstore doesn't try to reflect the latest trends, it is a part of the scene, and it sets the new trends itself. Artazart is specialized in one particular area of visual arts - design, and this is also the main focus of their stock. Actually, they claim to be Europe's number one design bookstore, and we wouldn't be that surprised if this statement was true. If we were to exaggerate a little bit, we could even say that this is probably the only bookstore where HOW something is written matters more than WHAT it says. Needless to say, this bookstore is a true delight for browsers, and it would be fun to hold a competition for the book with the best looking cover. Another positive impression is related to the atmosphere inside, which is very casual and relaxed. When it comes to a massive stock of art books, the only serious threat to Artazart could perhaps be the bookstore at the Centre Pompidou (for those unaware, the Centre Pompidou is one of Paris' best known modern art buildings/museums). 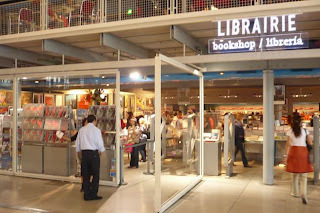 Actually, there are three bookstores in the Centre itself: the main one in the Forum (immediately after the entrance and no admission fee is needed to enter the bookstore) and two smaller ones (levels 4 and 6, both focusing on the materials and publications related to the temporary exhibitions in the Centre) and all three are owned by an independent company, the Librairie Flammarion Centre. The (main) bookstore, designed by Renzo Piano, the center's architect, looks stunning: the white interior, the postmodern design of the shelves, the organization of books - everything oozes modernity. It holds over 10,000 titles and the stock ranges from the material published by the Centre (various postcards, multimedia publications, etc. ), to an enormous selection of books on general art, architecture and design, as well as various art magazines and reviews. All of the publications are mostly in English and French but you may stumble upon other languages here and there. To sum it all up, the five days we spent in Paris during the summer of 2008 were hectic at several points, as there were so many things we wanted to see. But we've definitely enjoyed every moment of and we're glad that we're also able to offer you this défilé (as the French would call it) of the Parisian anglophone bookstore scene. Thanks for the report. I've lived in the city for over 10 years but you've taught me things I didn't know! I'm not sure if you are aware of the law, but one reason why so many independant bookstores have survived in the city is because of the 'Loi Lang' which was passed in 1981. It stipulates that book prices are fixed by the editor, and each store must sell the book at this price (a reduction of 5% is sometimes allowed). This has prevented large groups from dominating the market, and you will never see any '3 for 2' offers for example which have killed a lot of the competition in England. 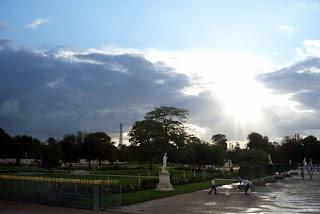 Lovely blog, I can imagine my husband and myself referencing it whenever we travel from Paris. 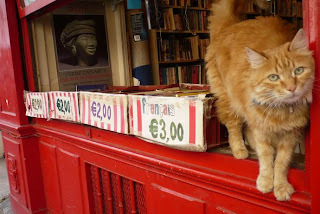 Or, for that matter, whenever we want to browse books IN Paris! Just back from a cold Paris but my heart was warmed by visiting Shakespeare and Co and soaking up the atmosphere. I also managed to find a rare book I wanted for a great price which I sat and read upstairs in the library. I also visited Abbey and met Brian who offered me a welcome coffee. I also had luck in his basement and found 2 more books that I had to buy. All in all a great experience. My name is Hamid Sahel i am living in Afghanistan, Kabul, i am looking for a Man his name is somthing lik Alled tolie he is from France, about 40 years ago he was working as Economy Consulat in embassy of France in Kabul, Afghanistan. I, heard now he has a big book store in paris, his son name is Phillib, my grand father was his driver on that time here in kabul. if you could helpe me to find this gentleman. it would be very nice of you. my emial h.sahel@saelitint.com. I am in paris and I am looking for a bookstore where I can find historical and political books. Thank you! Reading your blog gave me goosebumps- Oh all those lovely bookstores yet to be visited, to be seen, to be smelt,to be lost in. I live three hours away from Paris and visit often. I will go on a book trip soon. Fantastic blog, very much enjoyed reading it. Will be very helpful in Paris. According to the website, Tea & Tattered Pages is temporarily closed due to the passing away of the former owner, which is a sadness. That was some six months ago, so I do hope they have had luck in finding a new owner. Shall definitely hit your other recommendations. Thank you so much for this list!